If you are not sure if you have a valid support program, check it as described in this article. Make sure all product serial numbers are registered under your account. If not, register them as described in this article. If there is any issue with the Upgrade not working, please contact Acronis Customer Central with a reference to this article and your purchase confirmation (Invoice, License certificate). 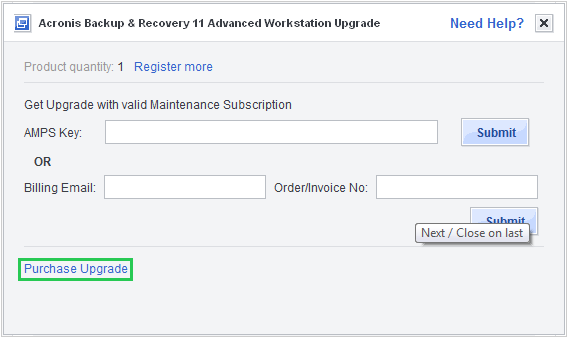 If you have a valid Acronis support program, you will see the Get free upgrade button. Press it and Upgrade Serial Numbers will get automatically registered under your account and will also be sent to your mailbox. If you have any issues, please contact Acronis Customer Central with a reference to this article and your purchase confirmation (Invoice, License certificate). Please make sure you have serial numbers for the previous version available.